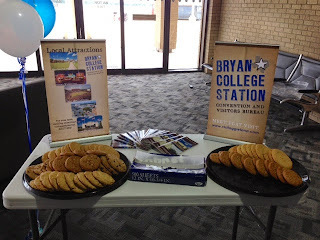 Chasing Roots: Welcome to Aggieland! Many College Station travelers arrive at or depart from the region's larger airports and then drive the distance between those cities and College Station. But after more than four years in Aggieland, Tom and I have discovered that flying in and out of Easterwood Airport in College Station costs only a small amount more - if anything at all - and results in shorter, smoother, more enjoyable travel. When flying with children one of course hopes (and prays…and wishes…and begs...) for shorter, smoother, more enjoyable travel, which is why my mom and niece flew into Easterwood last week. I showed up a few minutes prior to their scheduled arrival, just in case the plane landed early, and found myself smack dab in the middle of what appeared to be a party. Throughout the lower level, a number of men and women looked poised to jump out from behind their balloon bouquets, brightly colored Aggieland displays, and festively decorated refreshment tables to yell "surprise!" at an unsuspecting visitor. Upstairs, more men and women enthusiastically passed around noisemakers and held up hand-painted signs reading, "Welcome to Aggieland!" and "Thanks for Coming!" I started getting excited, thinking perhaps George H.W. or Johnny Football or even Reveille might arrive on Grandma and Lily's plane. 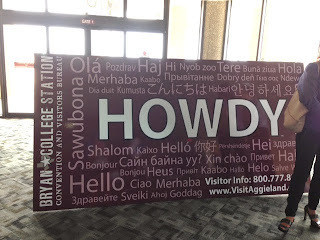 However when I asked one of the noisemaker-wielding young men why the fuss, he explained that he and his fellow Convention and Visitors Bureau employees, in honor of National Tourism Week, were spending the day at Easterwood to simply welcome people - all people - to Aggieland. He asked what/who brought me to the airport that day, and when I shared that my four-year-old niece Lily was coming for a visit, he passed her name on down the line. Then, as Grandma and Lily emerged from the terminal, the party squad blew their noisemakers, waved, cheered, and yelled, "Welcome to Aggieland, Lily!" Yes, those deplaning - including Grandma and Lily - appeared confused at first. (I can't say I blame them…) But once they realized the hullabaloo had been designed and carried out with only the best of intentions, they relaxed and enjoyed the friendly welcome and delicious cookies. Have you ever witnessed this kind of hospitality in an airport? Or anywhere, for that matter? 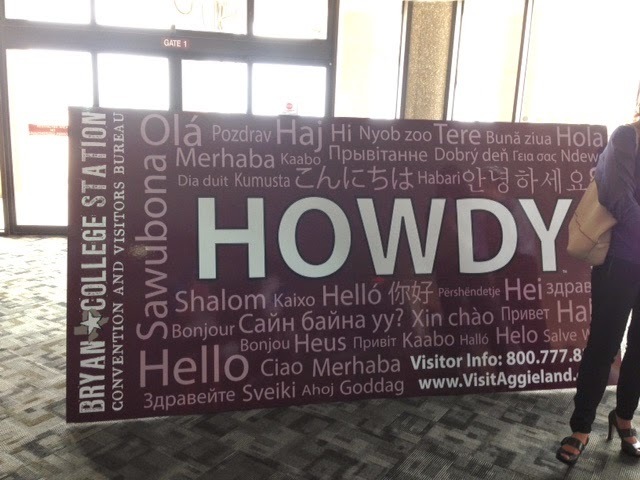 If not, consider a trip to Aggieland, where the official greeting is "Howdy!" and most people go out of their way to make sure strangers feel like anything but. And if you give me a heads up when you're on your way, I'll check in with the Convention and Visitors Bureau folks to see what kind of welcome we can have waiting for you.